On this week’s Social Media Marketing Talk Show with Michael Stelzner, we explore LinkedIn updates with Erik Fisher, new Facebook ads with Amanda Bond, the new Facebook design, and other breaking social media marketing news of the week! If you’re new to the show, click on the green “Watch replay” button below and sign in or register to watch our latest episode from Friday, August 18, 2017. You can also listen to the show as an audio podcast, found on iTunes/Apple Podcast, Android, Google Play, Stitcher, and RSS. Facebook gives advertisers more control over mid-roll ad placements. Facebook introduced more features and improved insights to help marketers amplify branded content. Facebook Introduces New Look to News Feed and Commenting Features: Over the coming weeks, Facebook is rolling out several updates “to make News Feed more conversational and easier to read and navigate” and refreshing the overall look of the site. These updates include a new comment style that makes it easier to see which comments are direct replies to another person, improved readability across the site, cleaner circular profile pictures, and more. These changes will roll out to all iOS and Android users over the next few weeks. 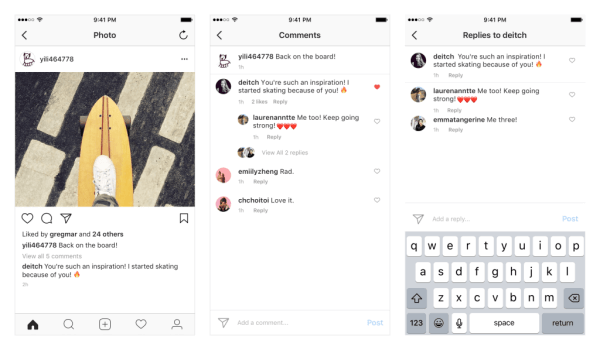 Instagram will roll out threaded comments on iOS and Android over the coming weeks. Facebook Adds eBay Daily Deals Section to Marketplace on Mobile: Facebook is testing a new feature within the Marketplace section of the mobile app that aggregates eBay’s Daily Deals for “a small percentage of people in the U.S.” Users with access to this feature can shop directly from the Facebook app to source new and interesting consumer electronics, fashion, and home and gardening products. Then they can complete the checkout process on eBay’s website through Facebook’s in-app browser. TechCrunch reports that eBay’s Daily Deals are being tested on both the Android and iOS Facebook mobile apps. Neither company has confirmed if this feature will be rolled out more broadly. Facebook Enhances Birthday Experiences With Two New Features: Facebook announced two new birthday experiences that it hopes “will make birthdays even more meaningful while you’re celebrating on Facebook.” These include the opportunity to dedicate one’s birthday to support for any of the 750,000 U.S.-based non-profits available through Facebook’s Fundraisers tool and new auto-generated, shareable birthday videos that can be personalized with images of you and the birthday celebrant. 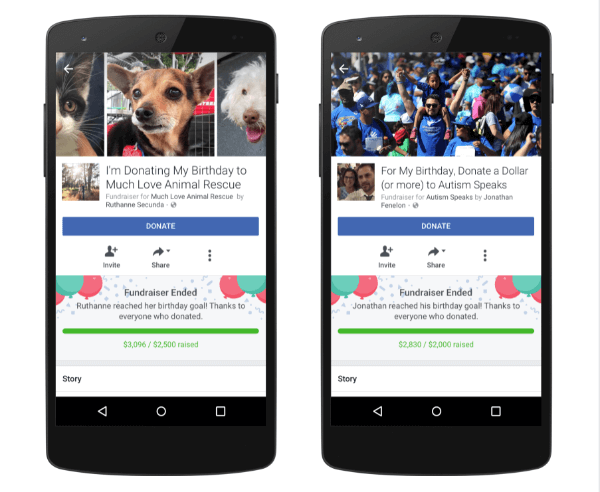 Facebook announced two new experiences that will make birthdays more meaningful. Facebook Launches Dedicated Trending News Section on Mobile App: Facebook is rolling out a Trending News section on mobile and its own link in the app’s main navigation. The new Trending News section can be found on both iOS and Android devices and features the latest stories with a focus on headlines and sources, not just topics. The news items will also be ranked based number of likes, comments, and shares each has received. Facebook Allows Admins to Link Pages to Personal Profiles: Facebook page admins can now link the pages they manage to their personal profiles. When users add their page to their profile, they’ll automatically be listed as a “team member” on that page. 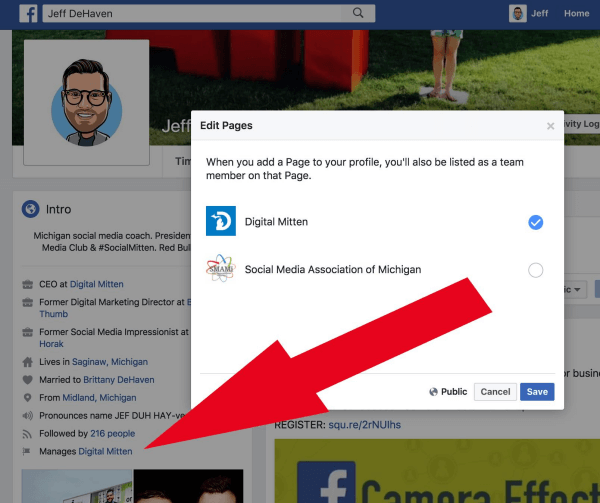 Facebook page admins can now link the pages they manage to their personal profiles. Snapchat Launches New Crowd Surf Story Feature: Snapchat’s new Crowd Surf tool uses artificial intelligence machine learning technology to analyze snaps submitted to Our Story by multiple people recording the same musical performance at the same time. It then laces together the different angles to provide a “near-seamless” look at a live event from multiple perspectives. 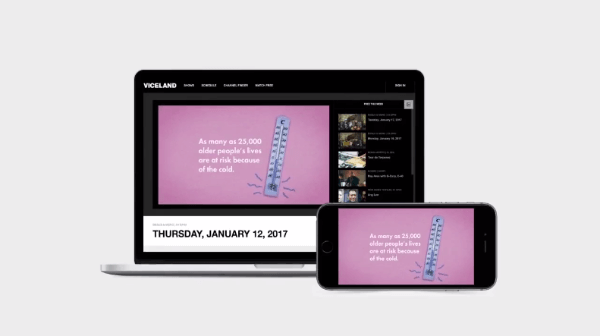 This new feature allows users to choose where to begin watching the stitched video and includes more than 10 seconds of footage in a row. TechCrunch reports that “Crowd Surf is set to be available at more public events in the future including concerts and speeches, but will require tons of people shooting and submitting Snaps from the same moment,” which limits its functionality to large events. Pinterest Adds Pinch to Zoom Feature to Pins and Refines Visual Search Tool: Pinners can now get “a closer look at every inch” of a pin with the new Pinch to Zoom feature rolling out to all pins on iOS devices. 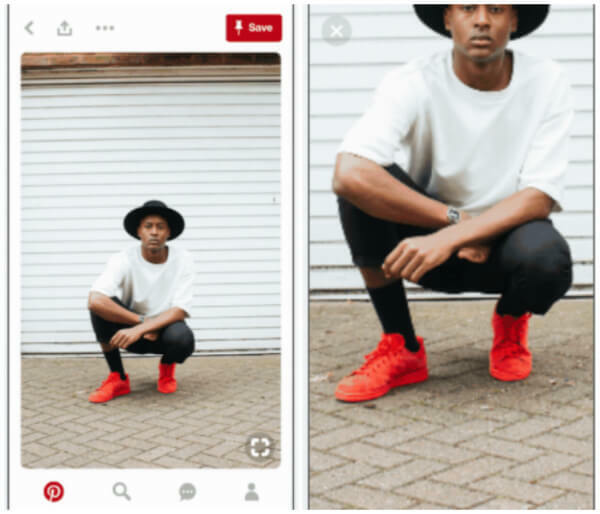 Android users “will be seeing it soon.” Pinterest also announced an updated look for the visual search tool that makes the button “clearer… [and] a little easier to reach” and expanded this new feature to the Pinterest Save Button, a Chrome browser extension that allows visual searches without a Pinterest account. Pinners can now get a closer look at every inch of a pin with the new Pinch to Zoom feature rolling out to all pins on iOS devices. 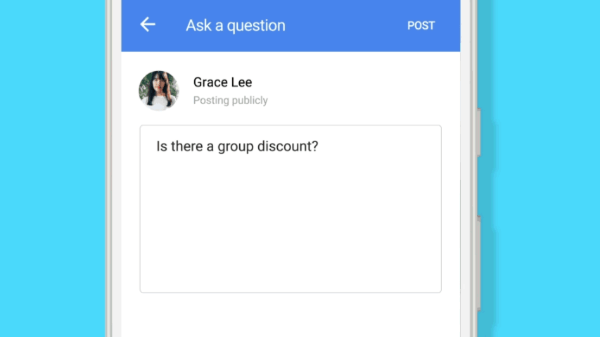 Google Rolls Out Q&As in Google Maps and Mobile Search Worldwide: Google announced the rollout of a new Q&A feature to Google Maps and mobile search. Users now have the option to ask or answer questions about a location, landmark, or specific businesses within its Maps or mobile search listing. They may also scroll through existing conversations about a place and upvote the most useful ones. Business owners and “other in-the-know users” will be notified when questions are posted so they can provide an accurate response. This new feature is currently available to all Android users worldwide. Google rolled out a new Q&A feature in Google Maps and mobile search worldwide. YouTube Tests Live View Counts in Mobile App: YouTube is testing a new live counter feature inside the YouTube app for Android that shows the number of viewers watching an uploaded video at a particular time. The counter is displayed beneath the video’s title and joins other metrics such as overall views, likes, and dislikes in offering greater insights on a video’s popularity. Facebook Expands Marketplace to More Countries: Facebook announced plans to roll out Marketplace to 17 additional countries across Europe, including Austria, Belgium, the Czech Republic, Denmark, Finland, France, Germany, Hungary, Ireland, Italy, Luxembourg, the Netherlands, Norway, Portugal, Spain, Sweden, and Switzerland. Facebook Marketplace was previously only available in Australia, Canada, Chile, Mexico, New Zealand, the U.S., and the UK. Google Brings Hands-Free Calling Capabilities to Google Home Hub: Users can already use Google Assistant to help them place a hands-free call to anyone on their mobile phone. Google announced that people in the U.S. and Canada will soon be able to do the same on Google Home. This new AI service will be easy to use and free of charge. It will also feature voice recognition to support multiple users and give greater context around whom to call. Google also notes that calls can be made to the user’s own personal contacts, as well as millions of businesses across the U.S. and Canada. SoundCloud Saved by Emergency Bailout Package: SoundCloud was in danger of being terminated last week but was saved by a round of $170 million emergency funding under the condition that its current CEO be removed.